Peak Protector Roof Ridge Vent Animal Guards - Keep Bats Out 100%! What Does Peak Protector Roof Ridge Vent Animal Guards Do? Ridge vents are common entry points for all types of pest animals, but Peak Protector Roof Ridge Vent Animal Guards are the perfect solution. They serve to ventilate attics where air might otherwise become stale but are poorly equipped to deal with intrusive creatures. Some animals, such as bats and birds, can fit into incredibly tight spaces. Also, some birds can fit into gaps as small as 1/4″. This makes it difficult to effectively prevent wildlife from entering your home. 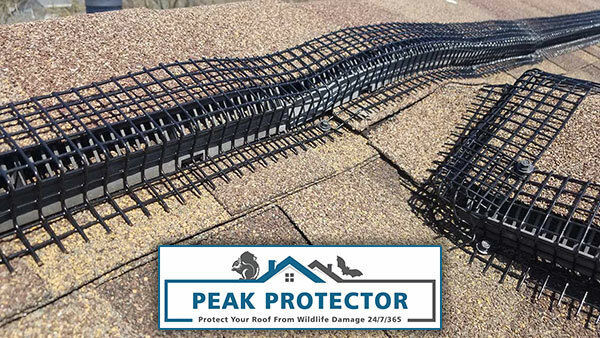 Newly installed Peak Peak Protector Roof Ridge Vent Animal Guards will protect your ridge vent and conform to uneven roof surfaces. The need for a quality, yet affordable Ridge Vent Animal Guard was needed for the wildlife control industry. So, Peak Protector was developed to fill this void. Peak Protector keeps pest animals like bats, mice, squirrels, and birds out of your home and attic without interfering with your attic’s ventilation. If you are have to remove bats from your home’s attic there is a solution. Get THE BAT VALVE, The Most Versatile One Way Exclusion Device to Get Bats Out. The Bat Valve is the last bat exclusion device you will ever need. The Bat Valve one way design allows bats to exit the structure with no chance of bats getting back in. Made for the professional, but easy enough for the homeowner. There are many styles of roof ridge vents. But, Peak Protector’s unique design separates itself from any other product on the market. 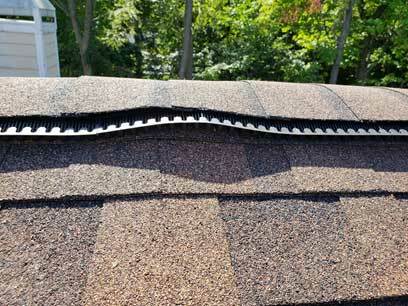 And that design protects any ridge vent – guaranteed! The photo below is an extremely common bat entry point where warped ridge vent buckles up and allows for easy access for bats into the attic, and eventually inside the home. If bats find their way inside your home, contact one of the many Bat Removal Specialist’s listed on the Bat Removal Pro site and ask for more details about how Peak Protector Roof Ridge Vent Animal Guards can protect your house from wild animal pests. Peak Protector Roof Ridge Vent Animal Guards installed in your home won’t buckle like the one above! Guaranteed! Looking for a Way to Keep Bats Out of Your Attic? The Peak Protector design keeps out pesky animals like birds and bats. Bats only require a 3/8″ gap to get into your house. This makes it very difficult to keep bats out of the attic without interrupting the airflow necessary to properly ventilate your home. Each guard construction keep out pesky animals such as bats while allowing air to flow freely and easily. Peak Protector guards are not only effective, but also highly durable and affordable. Coated metal wire makes up the Peak Protector guard. It looks no less natural than a vent or chimney cap from the ground. Furthermore, it is easy to transport — coming in 4 foot long sections. This also makes for easy carrying up and down a ladder without worry. In a pinch, there are some DIY WAYS to keep bats out of your attic. That said, it can be difficult to make functional preventative structures without the proper knowledge and experience to see these projects through. Most residents turn to their wildlife control specialist to determine the best options for keeping animals out of their home. Peak Protector is the perfect solution to keep bats from gaining access to your attic through roof vents. Furthermore, it comes out of the box ready to install and doesn’t require animal-specific knowledge. When working with bats or at heights we recommend hiring a trained professional to install Peak Protector Roof Ridge Vent Animal Guards. 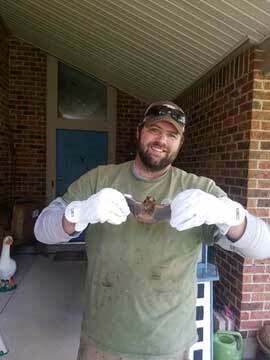 Seen below is a BARNES WILDLIFE CONTROL technician removing a bat from a ridge vent in Ohio. Peak Protector Roof Ridge Vent Animal Guards protect you from needing a Bat Removal Professionals. Protect your home from costly cleanups and repairs. How Do I Purchase Peak Protector? Peak Protector is available HERE. Peak Protector is guaranteed to keep bats and other pest animals out of your attic. Furthermore, it won’t mess up the ventilation in your attic. Don’t wait — try Peak Protector and solve your invasive animal issues today!